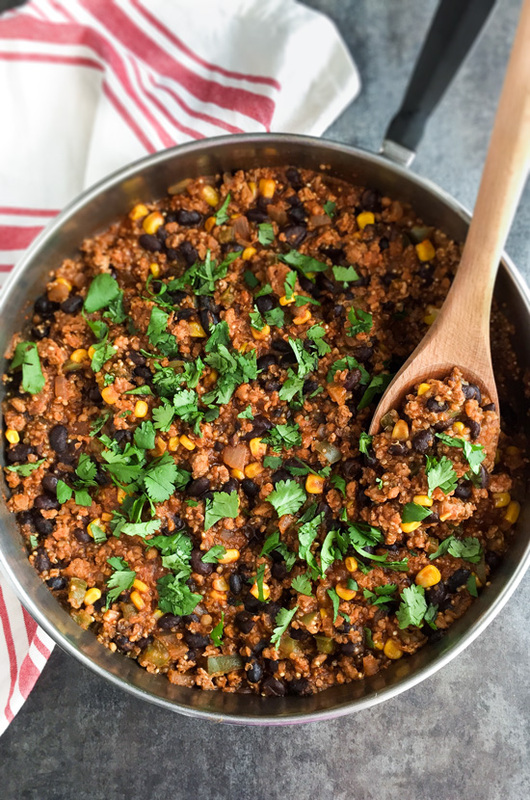 An easy and healthy weeknight meal that has a ton of delicious flavor! 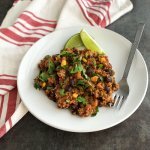 This is a terrific Mexican quinoa recipe that’s perfect for busy weeknights because everything is cooked in one pan. This is also a healthy dinner dish that really doesn’t feel like your eating healthy. That’s always a bonus in my book. Eating healthy doesn’t have to mean eating baked chicken and steamed veggies. Spices are my favorite way to make a healthier dish taste super yummy. I didn’t use corn the first time around, but I really like the hint of sweetness that the corn adds to the dish. You may have noticed that I use ground meat and poultry the most in my recipes. That’s because it’s one of most affordable options when you are buying pasture-raised chicken or grass-fed beef. A pound of boneless, skinless chicken breast can cost you twelve or thirteen dollars. Yeah, so not cheap. Buying ground chicken and chicken thighs are a more cost effective option. Still not super cheap, but it’s not a crazy amount more than conventional, and it’s better for you. 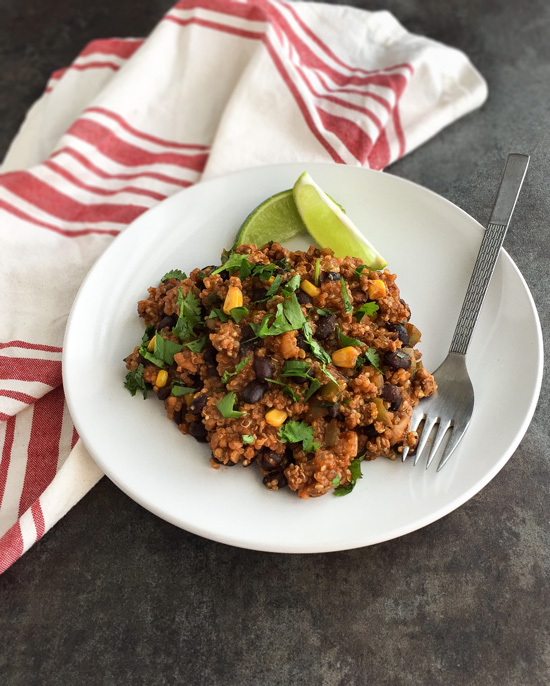 Plus it’s easy to stretch a pound of ground meat like I did in this One-Pan Mexican Chicken Quinoa recipe. This made enough for two meals for my husband and I. Depending on who you are serving, this makes between 4-5 servings. *I use the TruRoots brand of sprouted quinoa in my dish, which comes pre-rinsed. If you are using regular quinoa, you will want to rinse it prior to adding to the skillet. Heat the oil over medium-high heat in a 10.5-inch skillet (one that has a lid). Add the onion and cook for a couple of minutes. Add the bell pepper and continue to cook for another two minutes. Add the ground chicken to the pan and cook, breaking it up with a spatula or spoon as it browns. Once the chicken is fully cooked, add the seasonings, and mix to coat the meat and vegetables while it cooks for a minute more. Stir in the water, tomato sauce, beans, corn and quinoa. Bring to a boil, reduce heat, cover and let simmer, stirring occasionally, until quinoa is tender and translucent, about 25 minutes. Stir in the cilantro and serve with lime wedges. By Tempie at September 5, 2017 .